PMC Cor review | What Hi-Fi? How’s your Latin? If it barely extends to remembering your old school motto, you might like to know that 'cor' means 'heart'. (Okay, we Googled it). It’s a fitting name for PMC’s first stand-alone domestic amplifier, which is the heart and hub of a system. The core, if you like. As this is a first for PMC, it would be easy to assume it doesn’t have much previous experience of electronics. But the company has been making amplifiers since it was founded in 1991. Those amps were built into its first product, the active BB5 speakers, which are still used as reference monitors in the BBC’s Maida Vale Studios. So why make a standalone amplifier now? There doesn’t appear to be a grand plan to augment its highly successful range of speakers with an expansive line-up of electronics. At the moment, the Cor is just a solo project, made simply because the designers wanted to. Though if it’s really successful, don’t be surprised to see further additions. This integrated is a simple beast at heart. The designers aimed for transparency and musicality above all else, and such qualities tend to be stifled when combined with a complex and/or extensive features list. It’s a purely analogue amplifier with short, clean signal paths. It uses Class A/B circuitry and produces 95W per channel, which rises to 140W into a 4ohm load. On paper that’s a good-if-not-exceptional set of figures, but in use this amplifier belies those relatively modest numbers by delivering high volume levels with a whole range of speakers. Take the Cor’s lid off and you’ll find two power supplies – an impressively chunky device for the audio circuits, and the other for the control systems – alongside high quality components and a neat circuit layout. This product feels like something designed to be in service for years. The overall build reinforces that impression with a hefty 12kg weight. That distinctive fluted aluminium casework feels immensely sturdy and is nicely finished, though it lacks the slickness of premium products from industry majors such as Marantz or Sony. There are two colour options for this product – the black of our review sample or a fetching silver. The fluted design doesn’t just look distinctive, it’s also meant to aid heat dissipation by allowing the amp to run slightly warm - but no warmer. We like the metal remote – it’s nicely weighted, sensibly laid out and so much better to use than the offerings supplied by most high-end companies. The amplifier’s feature list is basic, but covers all the essentials. There are five line-level inputs, including a single balanced XLR. If you use a record player you’ll have to budget for an outboard phonostage, such as Cyrus’s Phono Signature or Rega’s Aria. There’s a preamp output in case you need a bit more poke – unlikely in most situations – and also an input that bypasses the preamp section taking the signal straight into the power amp circuitry. 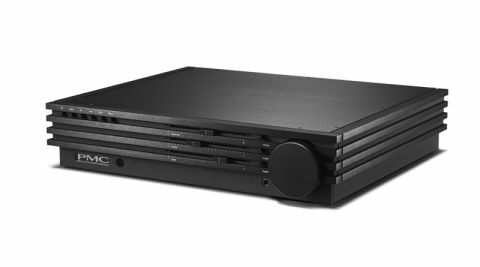 This allows the PMC to be integrated into a multi-channel home cinema set-up easily. The AV amp or processor then looks after all the digital processing and volume control duties, leaving the Cor to power the front two speakers. At the front you’ll find a large volume control, a series of tactile press buttons for input selection, mono and a bypass mode that gives the cleanest signal path (leaving the tone controls out of circuit). The bass, treble and balance controls are operated by motorised slider switches of the type more usually seen in a top-spec mixing desk. PMC’s engineers spent a long time listening to different sliders before deciding on their final choice. There’s a small LED indicator for each slider to tell you when the switches are dead centre. The tone controls are pretty subtle in use. They work in +/– 10dB limits, which should be more than enough to help with bright or thin sounding recordings. Unlike most we’ve tried, these don’t mess up the sound much either. Pressing the 'Bypass' switch only gives a slight improvement in precision and subtlety. We’re pleased PMC has included a headphone output. It’s a useful addition and takes away the need to buy an outboard unit and the extra clutter it brings. It’s a dedicated Class A/B amplifier circuit too, unlike many others that use a heavily padded signal from the speaker outputs. This bodes well for headphone matching and sound quality. If you’re looking for a premium integrated amplifier you can fit and forget, the Cor is it. Much like the similarly priced Leema Tucana II Anniversary, it’s an unflappable performer that gets out of the way and lets the music take centre stage. It’s unfussy about partnering speakers too, sounding as at home with our reference ATC SCM 50s as it does with more price compatible products such as Dynaudio’s Special Forty standmounters, Spendor’s A7 and Neat’s rather lovely Xplorers. The Cor is essentially transparent to the source, so if you like what that does you should like the results the amp will give you. We use our reference Naim NDS/555PS music streamer for most of this test with good effect, and also get fine sound from Cyrus’s CDi. But in this case transparent doesn’t mean characterless. Our test notes are full of words such as 'solid', 'robust' and 'confident'. Listen to a demanding piece of music such as Stravinsky’s The Rite of Spring and the PMC responds with enthusiasm. It delivers the symphony’s wide-ranging dynamics with ease, rendering crescendos with control and punch. There’s an enviable degree of substance to the lows, and they lack nothing when it comes to grip and agility. The Cor paints instrumental textures with skill and digs up a good amount of detail. It’s only when we start to compare this integrated to our reference Gamut D3i/D200i combination do we notice it’s not the last word in subtlety. There are fine layers of information that it doesn’t quite resolve. The PMC is about a third of the Gamut’s price, of course, and judged on its own terms and by price standards it is still very good in this respect. Apart from comparisons with pricier alternatives, at no point do we feel anything is missing. Tonally, it’s pretty close to neutral too. Sometimes hi-fi designers chase neutrality but end up neutering the life in the music. That doesn’t happen here. While the Cor’s frequency response sounds reasonably free of emphasis, it doesn’t short-change the listener when it comes to energy or excitement. If the recording has these qualities, this integrated will let them shine through. In short: if the music is meant to be fun, it will be. While the sound stage isn’t the most spacious we’ve heard, it’s still suitably expansive and with a good sense of depth. Instruments are nicely focused and securely locked in position. Large dynamic sweeps and high volume levels do little to ruffle the Cor’s composure in this respect. We play Beyoncé’s Crazy In Love and revel in the PMC’s excellent handling of rhythms. This amplifier is as musically cohesive as they come, conveying the changing momentum of a piece of music without ever sounding stilted or forced. There’s plenty of punch, combined with the ability to track a multitude of instrumental strands without sounding confused or disorganised. Voices come through with clarity, subtlety and no shortage of expression. When Beyoncé cuts loose, the amplifier is happy to let her do so. The recording isn’t the most refined around but, while the amplifier’s high level of insight makes that abundantly clear, the Cor doesn’t go out of its way to highlight shortcomings. The treble remains textured without lacking bite or smoothness. We try our usual Beyerdynamics T1s and Grado’s almost legendary RS1s headphones, and enjoy what we hear. The basic character of the sound is unchanged from that heard through the speaker outputs. The presentation remains bold and punchy while still having enough in the way of insight and refinement to keep us hooked. This amplifier won’t mark a turning point in PMC’s history. The company never intended it to - and it is too successful as a loudspeaker manufacturer for that to happen. But it shows that the brand knows plenty about electronics, and is more than capable of turning out products that are right up there with the class leaders from specialist electronic brands. If you’re looking for a top-class integrated amplifier, the Cor deserves a place near the top of your list. Highly recommended.